In 2013, eleven northeastern museums came together to initiate the Four Centuries of Massachusetts Furniture project to “celebrate furniture making in the Bay State.”1 A kind of Pacific Standard Time for brown furniture aficionados, this large and unprecedented partnership culminated in a series of exhibitions and conferences, a terrific new online resource, and the publication Boston Furniture: 1700–1900, a jewel box of new scholarship with nineteen essays and some 460 illustrations. 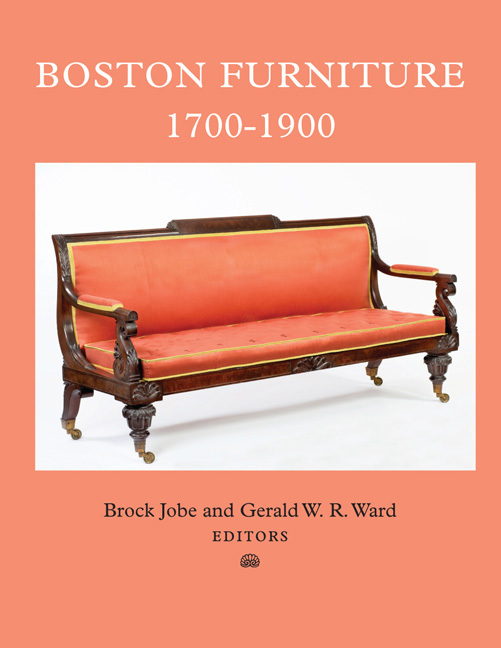 Edited by Brock Jobe and Gerald W. R. Ward, both of whom also contributed essays, and published by the Colonial Society of Massachusetts (CSM), Boston Furniture, 1700–1900 arrives some forty years after another seminal CSM volume on the same topic: Boston Furniture of the Eighteenth Century.2 The new book takes a fresh look at some of the same objects, asks some of the same questions, and even, in the illustrious Professor Jobe, boasts one of the same authors as the earlier volume. Like its predecessor, much of the book focuses on the eighteenth century. 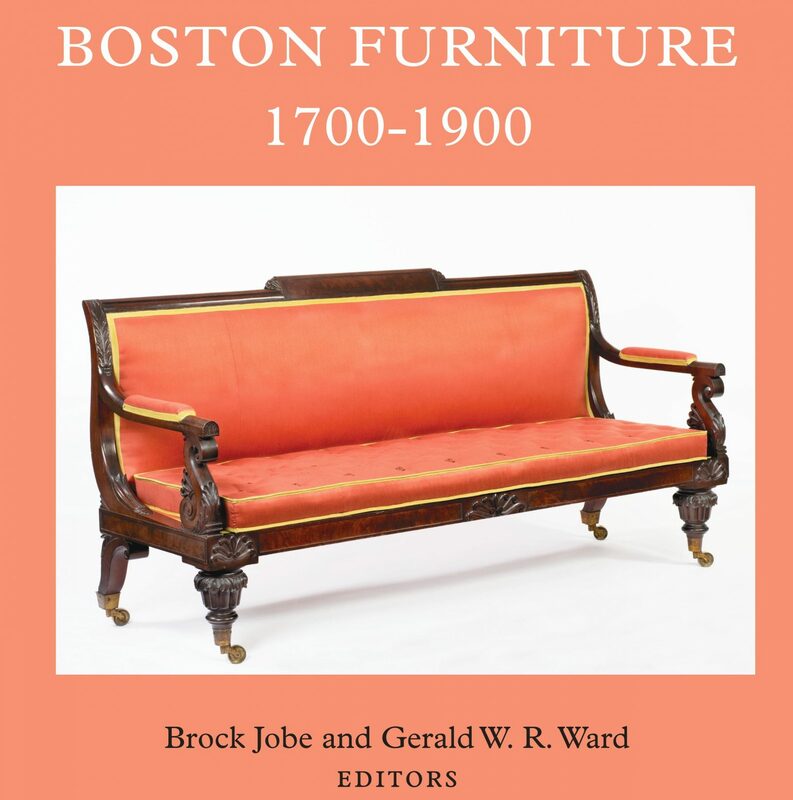 More than half of the essays consider this veritable golden age of Boston furniture, although there is a great deal of exciting early nineteenth-century and antebellum material covered here as well. At every turn, the spirit of Henry Francis DuPont and the Winterthur master’s program courses through Boston Furniture. Many of the writers are graduates of the program, and many of the essays were based on papers presented at one of the Winterthur annual furniture forums, filled with the sort of solid, old-fashioned connoisseurship for which scholars trained at Winterthur are famous. While some of these texts are so narrowly focused as to only be of interest to a small circle of curators and collectors, the best material is more widely accessible and a delight to read. Among the highlights: Jobe and coauthor Allan Breed identify a prized turret-top table in the Karolik Collection at the Museum of Fine Arts, Boston, as the work of Emil Dill, a German furniture maker who came to the United States in 1912, and Tara Cedarholm and Christine Thompson offer an extraordinarily thorough survey of the corpus of extant japanned furniture. Assessing thirty-nine of the fifty-three known pieces, they attribute five new objects to japanner Robert Davis and dispel certain long-held assumptions, such as the idea that japanners worked with templates and based their motifs on engravings in published sources. Readers of Boston Furniture will learn a great deal about specific makers as well as specific objects. There are some well-known names referenced, such as Samuel Gragg, and others who are new to the scholarly record, such as Benjamin Bass. The account by Robert Mussey and Clark Pearce of Issac Vose is particularly engaging. Their contribution paints a lively portrait of this artisan-entrepreneur, a kind of furniture-man’s Paul Revere, who built top-shelf classical chests, chairs, and tables, retailed English and French furniture, and essentially controlled his supply chain. Vose owned a sawmill and imported and sold exotic woods too, keeping the best pieces for his own clients. (Mussey and Pearce have also curated a great exhibition on Vose furniture at the Massachusetts Historical Society).3 Many of the makers featured in the volume were immigrants, and although Boston Furniture does not aspire to be topical, it does remind us of the important relationship between good craftsmanship and innovative design and open borders. Two essays in Boston Furniture are worth singling out for their distinctive approaches. Edward S. Cooke Jr. is an outlier inasmuch as he argues for uncoupling “name attribution from furniture pieces” (37). 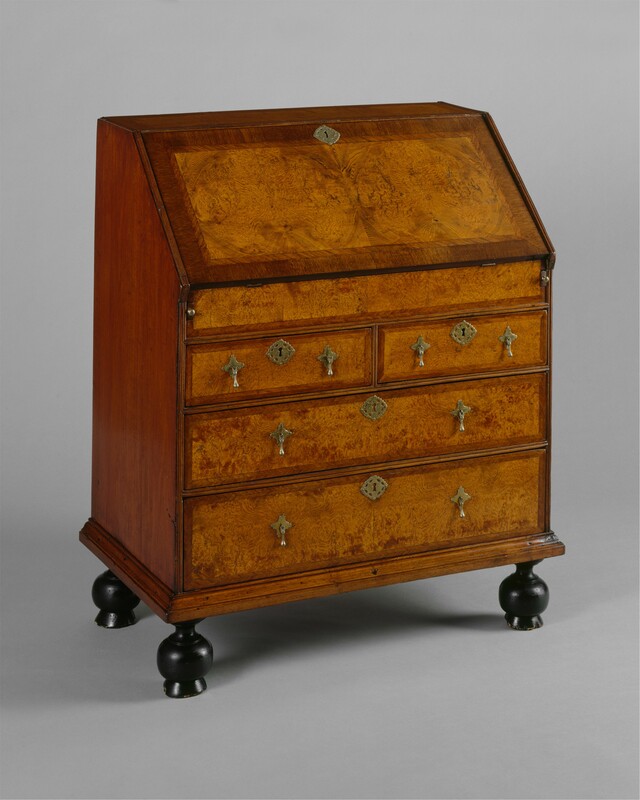 Cooke considers the fascinating turn-of-the-seventeenth-century moment when furniture makers introduced the chest of drawers to Boston (fig. 1). He argues that the transition from the joined chest (with its broad hinged top and horizontal plan) to this new stacked drawer form (with its fixed top and vertical elevation) constituted not only a change of taste or change of construction but a change of mind: “It is not simply the use of veneer or dovetailed drawers that distinguishes these examples as a new style, but rather an entirely different conceptualization of the carcass as a lightly articulated box with a front-facing void” (41). 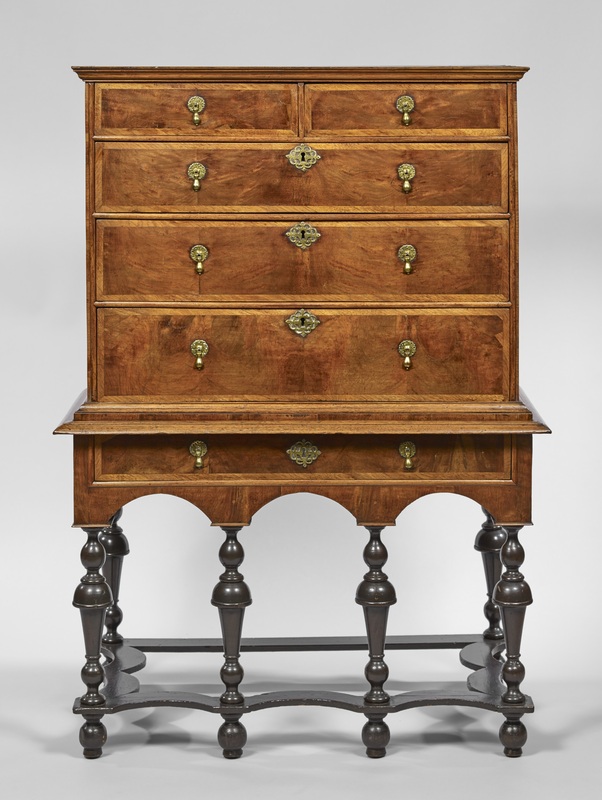 The link between furniture design and ways of seeing and thinking also provides structure for Gerald Ward’s study of the Boston desk and bookcase, which he describes in his title as “the merchant’s real friend and companion,” borrowing a turn of phrase from eighteenth-century British writer Robert Manwaring. Framing the desk and bookcase as both “work of art” and “working tool,” Ward’s essay is a pendant to “Matter in Place,” his influential 1988 thought piece on the interior structure of various pieces of case furniture (a must-read for anyone interested in this material).4 Ward guides the reader through the intricate architecture of the desk (fig. 2) and explores its almost end- lessly divided interior, finding in the increasing complexity of quill trays, pigeonholes, ledger-book slots, and secret drawers (one example he considers boasts an astonishing sixty-one interior compartments), a “timeline that reflects the evolution of information processing, data storage, retrieval and organization” (167). Cooke and Ward remind us that pieces of furniture are always more than the sum of their parts. That same theme underpins much recent writing on wood, and in particular mahogany, the material of choice for many of the makers featured in this book. Jennifer Anderson’s 2012 study Mahogany: The Costs of Luxury in Early America teaches us that we cannot think about bold figure and swirling grain patterns without thinking about slavery and the enslaved men and women tasked with the dangerous work of harvesting, sawing, and shipping exotic woods to America.5 Boston Furniture would have been a stronger book if its authors had grappled with Anderson’s scholarship and other recent work on the Caribbean to explore the many hands—some free, some enslaved—that contributed to the production of luxury objects, and the many Boston patrons enriched by the Caribbean trade. One hopes that future scholars will build on the considerable knowledge that is shared in this volume to develop a new model of connoisseurship that takes into account such factors, and that reads a cabinetmaker’s choices in light of the global social and economic systems in which the craft was enmeshed. Cite this article: Ethan W. Lasser, review of Boston Furniture, 1700–1900, edited by Brock Jobe and Gerald W. R. Ford, Panorama: Journal of the Association of Historians of American Art 4, no. 2 (Fall 2018), https://doi.org/10.24926/24716839.1668.